Long Beach’s rich and diverse culinary landscape, and its ever-expanding beer and cocktail scene, mean there’s no shortage of delicious food and libations to choose from. In our second division for Best of Long Beach 2015, we asked you to tell us about the places that keep your stomach happy and your glass full. You voted for your favorites, and here they are; your Best of Long Beach 2015: Food & Drink winners. The eatery’s signature Mac and Cheetos—a monstrous concoction of a home made four-cheese sauce, pasta and a crushed Flaming Hot Cheetos topper—had already gained the Attic local notoriety. It’s such a hit, in fact, it has its own emoji and a line of t-shirts and tank tops. Massis said he never envisioned its success, and that his intention was to put a spin on the classic that traditionally uses bread crumbs. When he opened the restaurant he didn’t think that it would become the flagship of the Attic. While mac and cheese is typically regarded as a lunch or dinner item, it is served all day, every day at the Attic. In fact, the only food you can’t order for breakfast is mashed potatoes, and that’s part of what Massis said makes The Attic’s brunch such a hit with patrons. If you’re an early riser and you’re craving a Reuben at 8AM, no problem. Had a long night on the town and want chicken fried benedict at 3:30PM? The Attic has your back. Not only does it serve breakfast until 4PM everyday, but it’s staff wont judge you for ordering a burger with a Bloody Mary (with a short rib garnish) for breakfast. And the vibe, Massis said, is tough to beat. The Attic is located at 3441 East Broadway, on the corner of Newport Ave. Visit the Attic’s website for more information. Photo courtesy of Basil Nabhan of Working Class Kitchen. The Michael’s Restaurant Group is no stranger to accolades. Its pizzeria was recognized as the the best in the nation by Zagat in 2013 and late last year Chianina Steakhouse and Michael’s on Naples were included in the 50 Best Restaurants in Los Angeles for 2016. So it comes as no surprise that Working Class Kitchen—the restaurant group’s own deli, butcher and sandwich shop—is now winning awards of its own. 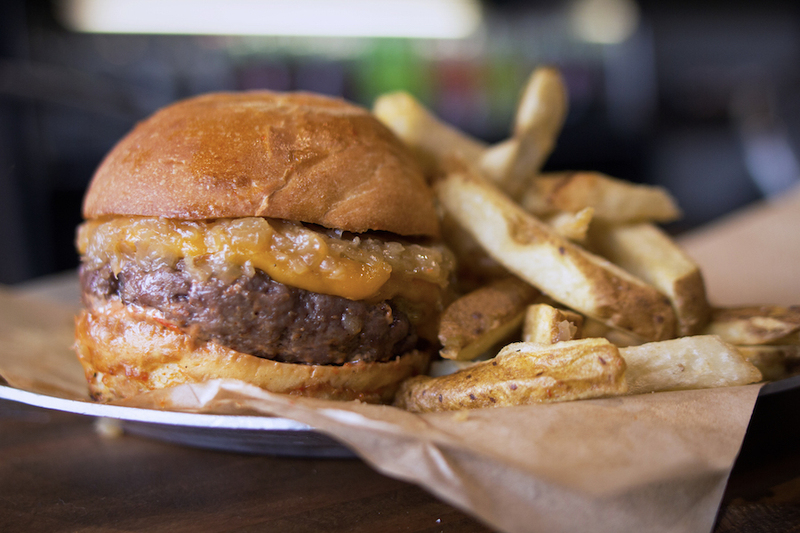 Voted the best burger in Long Beach, Executive Chef of Michael’s Restaurant Group David Coleman said the Chianina Beef Burger—a marriage of the Italian cow’s porterhouse and ribeye topped with caramelized onions and a remoulade—was a no-brainer. While the namesake cow of the Italian steakhouse can run upward of $5 per ounce in steak form, Coleman’s whole-animal philosophy led to the creation of burger which can be enjoyed at both Chianina and Working Class Kitchen, with a much smaller price tag. Although it can be topped with a variety of ad-ons including avocado, cheese, foie gras or an over-easy organic egg, what separates it from all the other burgers in town, Coleman said, is in the patty. “You have burgers that taste like beef, and then you have burgers that taste like meat,” Coleman said. The “meat and potatoes” ethos that the shop exudes belies who it aims to serve. Coleman said the working class work there, but they hope to feed everyone. The shop’s motto “Sine Labore Nihil,” or Nothing Without Work, reflects its dedication to serving up food with as much conviction as flavor. Working Class Kitchen is located at 1322 Coronado Ave., off of Anaheim St. Click here for more information. Brussels Sprouts have been making a comeback in the last few years in the foodie hall of fame, and 2015 was no different. With serious contenders that included Simmzy’s, Tavern on 2, Restauration and The Federal Bar, Bo-Beau Kitchen + Roof Tap won, for their delectable sprouts, doused with plenty of oils, parmesan and pepper. The taste is one you won’t soon forget, and that smell will stay with you for days. Former Executive Chef Katherine Humphus told the Post before the restaurant opened that the goal of the restaurant was to “create delicious, approachable food, and encourage people to try flavor profiles or combinations that they might not normally go for,” in regard to its restaurant food, while also creating a down-to-earth beer-centric menu for the Rooftap portion. For unique flavor profiles, Bo-Beau most certainly wins. Beyond their aroma, the sprouts have an unexpectedly intense flavor, thanks to a slightly sweet balsamic glaze, rich duroc pork lardon, and fresh shaved parmesan. Suffice to say, it’s impossible to stop at one brussels sprout—you’ll be eating the whole serving before you realize it. Bo-Beau Kitchen + Roof Tap is located at 144 Pine Avenue. Call 562.983.0056 or visit their website for reservations and more information. It’s not a well-kept secret that the Long Beach Post is already a fan of The Caffeinated Kitchen’s sweet vegan treats, so when founder, owner and doughnut baker Jen Hackler took the cake for Best Doughnuts in Long Beach, we weren’t surprised at all. The doughnuts, whether you’re biting into a Lemon Poppy Seed, Pistachio-Rose or Maple “Bacon” flavor, make up part of Hackler’s to-die-for repertoire of delicious vegan baked goods, found at just about any Long Beach coffee shop, from Lord Windsor Roasters to Recreational Coffee. The story of how The Caffeinated Kitchen won the votes for best doughnut in the city speaks to Hackler’s humility and the community’s adoration for the small town bakery’s product. Nestled in fifth place for what seemed like “the longest time,” Hackler never wanted to ask her fans and followers to “go out of their way to vote,” but, encouraged by Recreational Coffee owner Bobby Hernandez, she finally gave in and asked for a little assistance via Instagram; a call to arms against two major corporations, Krispy Kreme and Dunkin’ Donuts. You can follow The Caffeinated Kitchen on Instagram (@thecaffeinatedkitchen). For a list of locations that serve The Caffeinated Kitchen doughnuts, visit their website here. It’s not all butter-infused veggies and alcoholic beverages here: the Post asked its readers what they deemed healthy in 2015, and they were quick to respond. Rainbow Juices won by a sizable margin, boasting a juice cleansing menu, relationships with local farmers, local ingredients and healthy lifestyle values and embody Long Beach’s wellness culture. Plus, the aesthetics of the store, with minimalist rainbow dots and a wood-paneled entrance, make it hard to dislike the business’ dynamics. Cox said Long Beach’s unique spirit and people that made it a no-brainer to set up shop downtown. 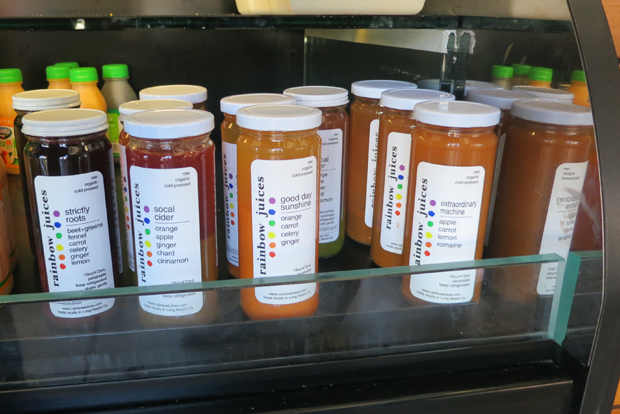 Rainbow Juices is located at 246 East Third Street, Long Beach, CA 90802. For more information, visit their website here or Facebook page, here. The local community has truly taken in Long Beach Creamery as one of its own, as a treasure to be kept near and dear to the hearts and palates of ice cream lovers across our seaside city. Owner and founder Dina Amadril built the business from the ground up, but not without the help of Farm Lot 59 founder Sasha Kanno and the ten strangers who first sampled her homemade concoctions at the very first tasting in 2013. One successful Kickstarter later, Amadril built what was supposed to be a diary room in Bixby Knolls, of which the scooping business has become more popular than she ever could have expected. Amadril creates new flavors every week to satisfy her instinctive creativity, but also to ensure that Long Beach Creamery is not a wasteful business. Some of her most popular flavors have come from using a little leftover pecan or a little leftover chocolate; you name the leftover, Amadril has a use for it. As Amadril would say, “There’s nothin’ real sad about ice cream.” Especially if you’re contemplating the Cashew Fennel Chip ice cream bread with a salt and pepper glaze, paired with a steaming cup of Black Ring Coffee. Need we say more? Long Beach Creamery is located at 4141 Long Beach Blvd. in Bixby Knolls. Visit Long Beach Creamery’s website here. Downtown Long Beach’s most recent and rampant recreational drug, third-wave coffee shop Recreational Coffee, has built a reputation for having some of the best coffee and service around. In a very short amount of time (since they opened just a few months ago), Bobby and Correne Hernandez have enticed the Long Beach community into trying their inspired creations, such as the sea salt affogato, delicious espresso shake and uniquely altered Americano. Alongside serving “ridiculous” beverages, Recreational Coffee has also begun to host public cuppings and pour-over classes, serving Nick’s Breakfast Burritos on Sundays and giving $1 off mochas on Mondays. Recreational Coffee clearly wants to ensure the community’s cup runneth over when it comes to providing a great place to learn, to work or hang out and, obviously, to drink an above average cup of joe. Recreational Coffee is located at 237 Long Beach Blvd. Suite A in downtown Long Beach. Click here for more information. 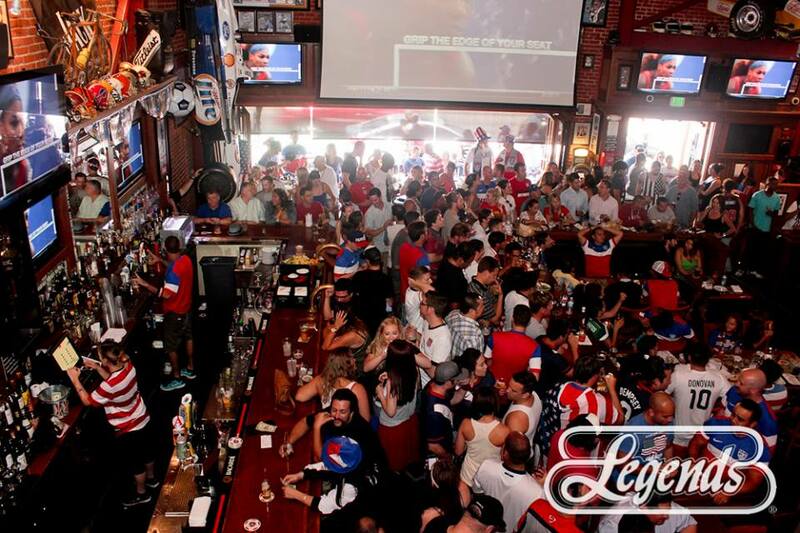 Photo courtesy of Legends Sports Bar. A bit of rye whiskey, an in-house turbinado syrup, orinoco bitters, a cherry and an orange twist make up The Stache Bar’s most famous whisky cocktail—the Old Fashioned—and no doubt one of the reasons why the establishment won over our readers as the best place for whisky cocktails in 2015. The drink, of course, is just one of many cocktails patrons can choose from, and it’s this craft and unique experience that bar owner Brett Gallo thinks brings people to The Stache Bar. “I think we owe it to them to make something special,” said Gallo, who created the original cocktail menu. From a classic Manhattan to a custom whiskey mule, Long Beachers know to go to the Stache for a wide selection and a quality cocktail made right—and at the right price—and served up with a smile by one the friendly bartenders. While Gallo said he plans to tweak the cocktail menu again—adding more locally-made vodkas to the menu—but whiskey lovers need not worry, their favorite cocktails will still be available. The Stache Bar is located at 941 E 4th St. Click here for more information. Tune in tomorrow, when we’ll reveal your top picks in the Arts, Culture & Entertainment division.